Here’s is the schedule on the blog. Or you can just go to either the fiber art workshop website or the painting workshop website. Enjoy and we hope to see you at the workshops. Don’t forget. It’s all about the romance. It’s about the chocolate. 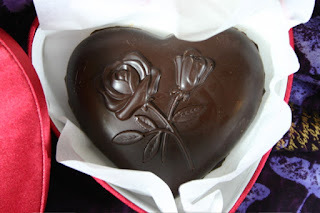 If you care about romance or chocolate then you’ve come to the right blog. I love this Book Heart. It’s just so appropriate for so many people. Aunts, moms, and wives. Or you can get THIS heart. It’s a royal treat. Isn’t it just lovely? Here is a Sassy Loving Heart. Again, this is the Fair Trade Dark Chocolate I use. This chocolate is 100% American Chocolate. The other one I use is Swiss and it’s also great. This is my solid rose heart. You can also get one without the rose decoration and it’s about an ounce lighter. 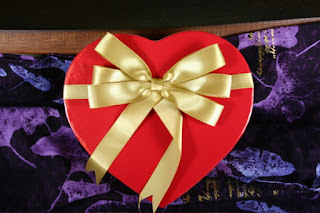 You can get this heart or the plain heart in the Sassy Loving Heart box or in the Satin Loving Heart box. 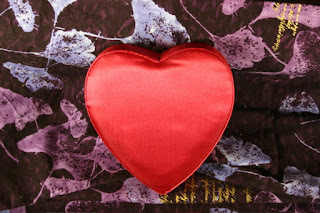 This is the very plush Satin Loving Heart. All of these boxes contain about 4-7 oz of chocolate, depending on the box. 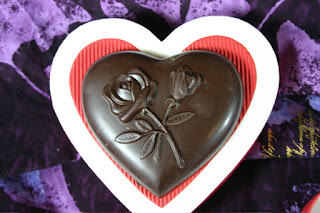 The Rose Solid Heart is about 4 oz and the smaller plain heart is about 3 oz. That’s a lot of chocolate. 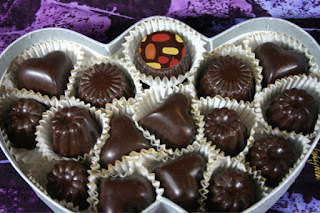 Just ask for mixed chocolates or specify what you want. 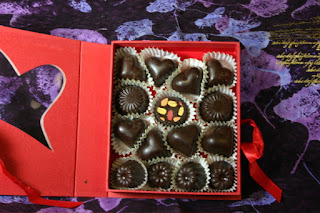 Go to http://www.lifebychocolates.com/ and ask for exactly what you want. 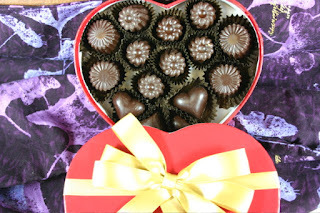 The web store will be up in a week or two but in the meantime, just call us and we’ll be happy to rush you a great box of chocolates. I’ve been taking pictures and Kim has been taking pictures. I’ll do a snow montage shortly. We went to Holyoke, MA so that Kim could go to a yarn shop. My mom and I went to eat Tibetan food and scoped out two chocolate shops. Decent chocolates but at one, the chocolatier was too heavy handed, literally, the truffles must have weighed a quarter pound each, and the other had their chocolates made elsewhere. My mother thought they all looked stale. Perhaps. That was New Year’s Eve. This is New Year’s Day. Happy New Year. Don’t forget about the chocolate sale. 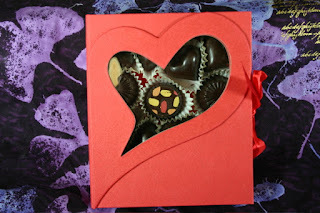 All those beautiful chocolate now on sale so that I can make more for Valentine’s Day. Happy New Year Chocolate Sale Extravaganza! Happy New Year and to celebrate we are having our first sale ever. 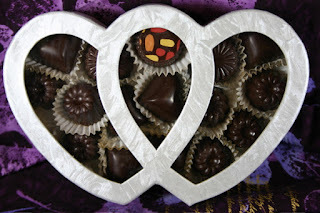 Our chocolate sale is starting tomorrow, Wednesday, January 2nd, 2008 and ends Wednesday, January 16th, 2008. Don’t call us on the 16th because by then the sale will be over. The internet gets the first shot at the sale. Call 518 966 5219 and we’ll be happy to take your order when we are open. Our hours are Wednesday to Sunday 10:00 am to 5:00 pm Easter Standard Time (EST). New York time. OK. What’s on sale and how much is the discount? All Christmas items, chocolate trees, milk and dark chocolate Santas, chocolate wrapped presents, white chocolate snowmen, you name it, it’s all on sale and it’s 50% off. You heard me right, it’s fifty percent off. You can just ask for a chocolate Christmas grab bag and have fun. Everything else in the store is 30% off. So, no matter what you order, you get it 30% off. Isn’t this fun? Valentine’s Day is coming up and we need to get ready. 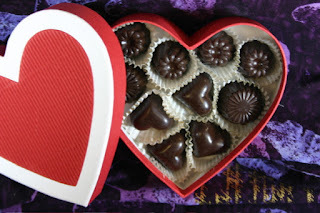 Right now we have no chocolate hearts or other Valentine’s Day chocolates. We have to make room on the shelves. 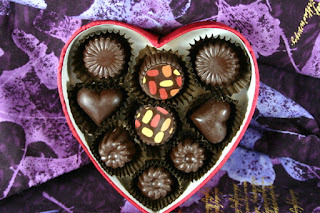 Our Valentine’s Day chocolates will go on sale January 16th, 2008. I got my cell phone back. Ernie sent it to me! Yea! If you ever need a taxi in Rhinebeck or Rhinecliff call Blue Top Taxi at 1-845-758-8294. Ask for Ernie. I’m dreaming of a white New Years…. And it IS white. It’s snowing beautifully. Everything is once again white and heavenly. I’ll be posting a montage of snow pictures. It’s still pretty warm right now so no big icicles. Just snow.